It’s no secret that cancer continues to be a huge problem in our society. Despite clear progress in cancer treatments throughout the past 40 years, as evidenced by significantly increased survival rates, current cancer treatments remain inherently toxic and have potentially severe short- and long-term side effects that can complicate care, diminish quality of life, and can be fatal. Academic researchers and private companies pour billions of dollars every year into developing better treatment options, yet safer and more effective therapies continue to elude us. Despite all the effort and resources deployed, the pace of improving cancer treatments is in fact slowing. Furthermore, small cancer markets like pediatric sarcomas, which affect about 1,700 children per year, have not been given priority in drug development pipelines. Every year, nearly one-third of children diagnosed with pediatric sarcoma die. While overall mortality rates have decreased over time, they continue to be extremely high for recurrent or metastatic cancers. There is still a desperate need for therapies that can address underserved populations, eradicate the cancer state without severe complications, and prolong the lifespan of the patient after diagnosis. NanoSmart Pharmaceuticals has taken on that challenge. Many of the cancer drugs in use today are non-specific mitotic poisons that inhibit tumor growth by killing cells that are rapidly dividing. Unfortunately, mitotic poisons can also kill any normal cells that are dividing. This is because the drugs have difficulty differentiating between the patient’s normal cells and the cancer cells. The inevitable non-specific destruction of healthy cells results in serious acute side effects and complications, such as vomiting, hair loss, anemia, and immune suppression. Despite the inability to discriminate between cancerous and healthy tissues, the current strategy for cancer treatment is to aggressively administer these drugs with the hope that the cancer can be eradicated before too many healthy cells are destroyed. While this approach has improved overall treatment outcomes, it still subjects the patient to very harsh treatments with potentially life-threatening complications because the toxic drug levels are often very close to effective drug levels. In order to mitigate the severity of side effects, patients are usually placed on a therapeutic regimen that provides for the staggered administration of several different drugs with intermittent recovery periods. As a result, any strategies that improve the safety and effectiveness of individual drug products are greatly desired. One way scientists have tried to enhance cancer therapies is by developing antitumor antibodies that can directly target the tumor. Typically, these are monoclonal antibodies that target certain kinds of growth receptors that are over-expressed on tumor cells. By binding to the growth receptors these antibodies can inhibit tumor growth. The initial monoclonal antibodies that were developed were made using mouse hybridomas. More recently, fully human monoclonal antibodies have been developed using phage display and genetic engineering technology. However, despite the extensive research into developing antitumor antibodies, less than a dozen antibodytargeted drugs have been approved by the FDA for cancer treatment. Those that have been approved are only able to treat a small portion of the patient population due to genetic variability within cancers. Specifically, the tumor markers that the antibody targets are not universally overexpressed, and thus, the antibody-targeted drug is only effective in small subsets of the intended cancer population. This problem is so prevalent in drug development that the current trend in the pharmaceutical industry is to develop highly specific markers that are effective for only small sub-populations. It is thus a very costly approach with increasingly limited applicability in the market. (3) passive targeting of the tumor site through “leaky” blood vessels that are characteristic of tumor vasculature. While this is certainly an improvement, it is not enough. According to Dr. Noah Federman, MD, Director of the Pediatric Bone & Soft Tissue Sarcoma Program at UCLA’s Jonsson Comprehensive Cancer Center and Mattel Children’s Hospital at UCLA, “The mere feat of achieving passive targeting of a liposome to a tumor does not necessarily mean that the particle will enter the cancer cell, nor that it will deliver its cytotoxic payload.” So while the safety profile of these drugs is indeed improved, optimal effectiveness and targeting ability continues to be elusive. Scientists attempt to address this problem by coating drugfilled liposomes with monoclonal antibodies (immunoliposomes). But unfortunately, the immunoliposomes developed thus far suffer from the same limitations of monoclonal antibodies alone (i.e., the limited ability for therapy to be effective in the entire patient population due to limited expression of the targeted tumor markers). The idea of improving cancer drugs using immunoliposomes has been around for decades, but to date, no immunoliposomes for the treatment of cancer have been successfully commercialized. The reason is that there is a lack of truly effective tumor-targeting antibodies being utilized to carry sufficient payloads of drug to the tumor site. Only a handful of antitumor antibodies have been developed so far, and it will take some time before they are successfully used to prepare immunoliposomes. The task of finding a specific cancer tumor marker that is ubiquitously expressed in the entire patient population is extremely difficult. While most cancer research has focused on developing antibodies that target specific tumor markers, NanoSmart is taking a different approach: localized targeting of the tumor with human-derived anti-nuclear antibodies. NanoSmart’s targeted drug delivery system targets areas of necrosis that are found in and around solid tumors (Figure 1). The antibody is collected and purified from patients that have an autoimmune disease called Systemic Lupus Erythematosis (SLE). The SLE antibody targets the nuclear material (DNA) found within all human cells. And because the antibodies are harvested from humans, the patient’s immune response limiting bioavailability of the drug is no longer an issue. As solid tumors grow, they cut off their own blood supply to the tumor core, causing the inside tumor cells to rupture and release nuclear material. The tumor also ruptures normal healthy cells that surround the tumor site, causing those healthy cells to also release their nuclear material. NanoSmart’s patented SLEantibody attaches to the nuclear material of these ruptured/dead cells found in the center of, and on the outside of, cancerous tumors. Because it is not specific for a particular cancer marker, the SLE antibody has the potential to target many different types of solid tumors, including prostate cancer, breast cancer, lung cancer, liver cancer, and rare pediatric cancers, such as Ewing’s sarcoma and osteosarcoma. Active tumor targeting is the ultimate goal of cancer drug development, and localized targeting of solid cancer tumors allows for virtually universal treatment. “We have taken an approach to targeting tumors that is different from other companies,” explains Dr. James Smith, President of NanoSmart. “We are treating cancer by targeting normal cellular material that is inappropriately expressed within, and near, the tumor mass.” Other regional targets that are currently being researched for the treatment of cancer include sites of angiogenesis and different pH levels of tumor tissues. NanoSmart has completed its initial immunoliposomal drug formulations of dactinomycin and vincristine, both of which are used to treat rhabdomyosarcoma and Ewing’s sarcoma. In fact, both vincristine and dactinomycin are part of the standard backbone therapy for rhabdomyosarcoma and are responsible for many of the doselimiting toxicities, such as peripheral neuropathy and myelosuppression, respectively. 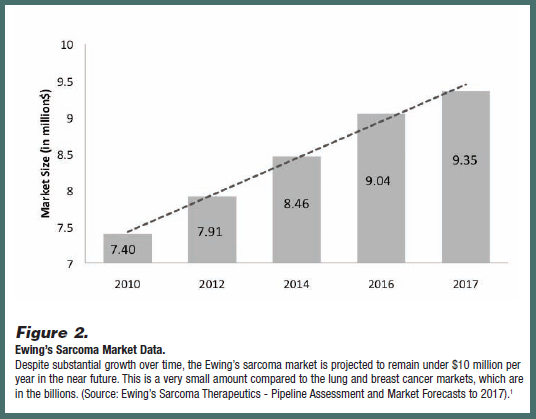 Because of the small patient population and low incidence of the disease, the Ewing’s and rhabdomyosarcoma therapeutics market is relatively small compared to other cancers (Figure 2), and untapped opportunity exists for companies with better disease cures and therapies with improved toxicity profiles. NanoSmart’s immunoliposome is capable of targeting multiple types of pediatric cancer. However, it is not limited to just pediatric cancers. Vincristine, for example, is currently indicated for Hodgkin’s disease, non-Hodgkin’s malignant lymphomas, rhabdomyosarcoma, neuroblastoma, and Wilms’ tumor. Using NanoSmart’s platform to reformulate vincristine into a safer and more effective drug has the potential to improve the existing therapy for many different patients with a variety of different cancers. NanoSmart has entered into several research collaboration agreements with Children’s Hospital Los Angeles (CHLA) and University of California Los Angeles (UCLA) Sarcoma Program in an effort to optimize drug formulations utilizing dactinomycin and to extend its indications for other pediatric sarcomas, such as rhabdomyosarcoma, Wilms’ tumor, and osteosarcoma. These entities are dedicated to finding solutions for these underserved patients, and are able to deploy significant resources to expedite NanoSmart’s drug development. In theory, validating NanoSmart’s drug delivery platform with just one drug would open the door for the creation of a broad platform of novel biopharmaceuticals, just by switching out the active pharmaceutical ingredient within the liposome. 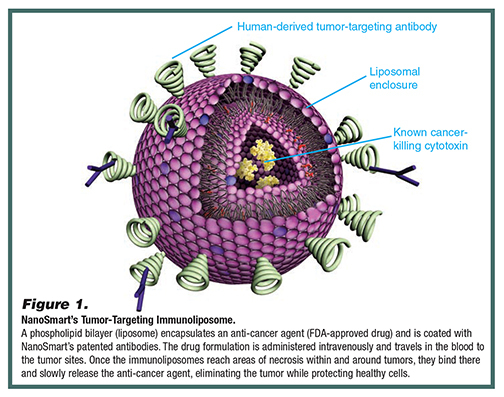 NanoSmart Pharmaceuticals is developing the next generation of targeted drug liposomes that target cancers by binding to areas of necrosis, which are present in and around many different types of tumors. The wide applicability of the platform to multiple cancer types has enabled NanoSmart to pursue the underserved, pediatric patient population that is in dire need of safer and more effective therapies. 1. Darling, Joan. A different View of Sarcoma Statistics. ESUN. 4(6). Revised October 2007. Website visited: http://sarcomahelp.org/articles/sarcomastatistics.html. Cindy H. Dubin has been a professional journalist since 1988. She is currently a Contributing Editor to Drug Development & Delivery. Prior to this position, she spent several years focusing her writing on pharmaceutical formulation and development. She has been recognized by the American Society of Business Press Editors for her work on nanotechnology, and her writing has been awarded by the prestigious Neal Award Committee for Journalistic Excellence. Ms. Dubin earned her BA in Journalism from Temple University in Philadelphia and her certificate in Business Logistics from Pennsylvania State University.